I like to think that I’ve lived in a relatively large number and variety of places and that I’ve generally enjoyed living in them. However, none of those places so instantly captivated me as New York City did. I’ve lived in Manhattan since June 2004 and find myself wandering around and seeing new things/events on a weekly basis. This blog is written to document my wanderings and discoveries within the five boroughs. Okay, mostly Manhattan, Brooklyn, the Bronx, and Queens (although I know I’ll show up in Staten Island someday, if only to take the Ferry). 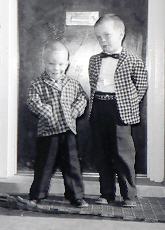 That’s Famous Ankles on the left (with Big Bro Mark). Over time, I’ve started to get a second meaning for the term “Famous Ankles”. I’ve started remembering the old Nero Wolfe stories and how Archie Goodwin would “ankle” about doing Wolfe’s directives. In a way, I’m ankling around NYC and documenting the famous places and things that I see. Even if only I think they’re famous and worth ankling to. Hello. I found your website by mistake, but it looks good. I try to keep up with all that’s happening in New York, but it can’t be done. I’m glad to see there are others trying out there. Keep up the good work! “About � Famous Ankles” genuinely got myself addicted with ur web-site! I actuallywill probably be returning considerably more frequently.